Several years ago I was told by an elder, Therese Kemelfield, from my community, to go and visit a museum collection store in Sydney. She told me there was a woman there called Taloi who I could contact to organise a visit. The entrance to the collection store was an unassuming door that led into a stairway. It was stark, sterile and had no sense of smell. The stairway had harsh concrete walls, fluorescent lights, with white painted handrails. There were multiple floors that we traversed to access the different levels. I felt completely disoriented and unsure if I was above or underground. Everything in the stores felt so dormant. I felt an immense urge to bring everything to life. Established in 1827, the Australian Museum is custodian of approximately 60,000 ethnographic items from the Pacific region. My first experience of viewing such a vast number of historical items was overwhelming. I started my tour in the Micronesian and Polynesian collections. I remember seeing a huge slit gong drum, an instrument I was learning to play at the time with Papua New Guinean musician Airileke Ingram. I wanted to hear the sound and resonance of that huge drum. I knew exactly where to strike it to get the best sound. But I refrained from what my body wanted to do and just observed. I progressed to the Melanesian collections, the largest amount of material collected by the Australian Museum. Taloi Havini, an artist from the Autonomous Region of Bougainville, who worked at the museum, guided me through this culturally charged space. As we moved through the anthropologically labelled collections, Taloi made me aware of the different energy levels in each collecting area: Polynesia, Micronesia and Melanesia. When we entered the Melanesian collections, we both sensed an energy shift. Taloi asked me “Did you feel that?” I nodded my head in agreement. I couldn’t wait to get to my cultural collection area of East New Britain. Taloi had strategically left it to last. We walked up and down the many aisles of shelves. They were up to three metres high and packed full of cultural remnants and fragments. It was information overload. There was so much history, so many beautiful things, so much knowledge and skill preserved in these stores. Then I saw something. I saw tabu—shells that were unmistakably the same type that my people, the Tolai, use as a form of currency. But within this object, the shells were used differently. I knew that what I had found was something incredibly important. It was an object called midi (middi) or as the museum tag referred, “shell collar”. I didn’t understand what this object was and why it was here. 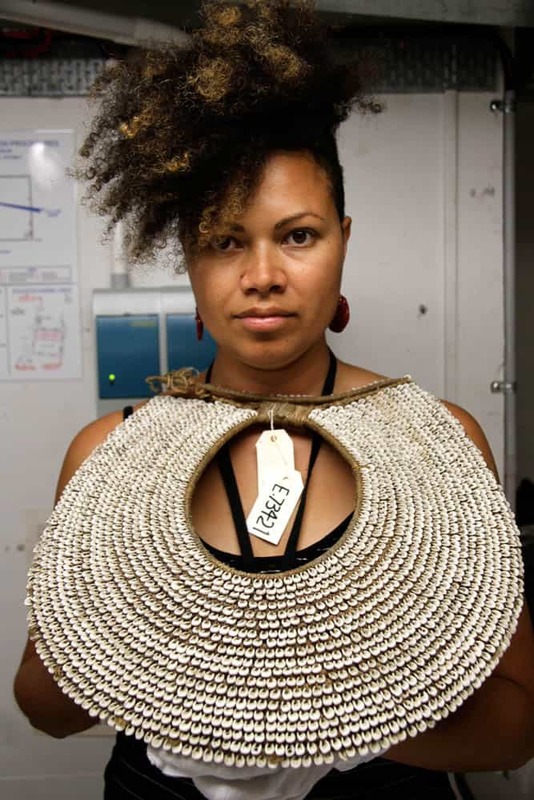 I knew inherently by the design—a rounded oval shape adorned with hundreds of tabu shells— that it was worn over the head and sat on the chest area of the body. My people the Gunantuna, or Tolai, are a cultural group that resides on the Gazelle Peninsular of East New Britain Province, Papua New Guinea. Historically, we migrated from the neighbouring province of New Ireland, a smaller sized island that lies adjacent to East New Britain. Apart from social pressures in our villages of New Ireland, it was the fertile volcanic soil on the island of New Britain that drew the Tolai people to migrate across the channel to what is now called the Gazelle Peninsula of New Britain. To read the rest of the essay, go here. This is available to Garland subscribers.